Need gossip? Wicked Chops Poker have a line on an interesting story about the dead beat dad. Last year they did a story about Dayne Baverman, a poker player who abandoned his wife and six kids, didn't even attend his daughter's funeral, and owed $77,600+ in spousal and child support. Well, guess who made it to day three of the Main Event? You guessed it, he started today on table 34 seat 4 with $65,100 in chips. Good find Wicked Chops! In other news...everyone's favorite pro, Phil Ivey is still in. Other pros in the spotlight include Daniel Negreanu, Allen Cunningham, Ted Forest, Joe Hachem, Josh Arieh, Tony Bloom, Mark Vos, Cyndy Violette, Surinder Sunar, Hoyt Corkins, Annie Duke, Freddy Deeb, Tom McEvoy, Chris Ferguson, Kathy Liebert, Susie Isaacs, Tex Barch, and Layne Flack, among others. .Net NOT.Com Fashion is always about what's In and what's Out. But at the WSOP, you don't really have a say in the matter. Tim Lavali wrote a great post today about Harrah's enforcing the .Net rule and all the stickers going round for the players. Even better was the picture that he had to go with his post. Nice one, Tim! Need coverage? Card Player can't keep people happy. I know the Gutshot boyz are working hard and I like their mix of pictures, chip counts, and commentary. Check out their Main Event coverage. It didn't really matter who won The Wager, everyone was looking forward to the payoff. 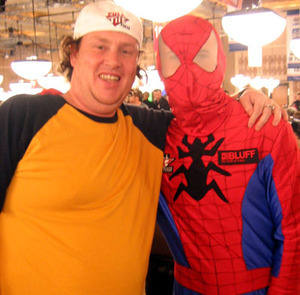 Gavin Smith and Joe Sebok had a pre WSOP bet over who would do better in the preliminary events. The one who dominated got to choose what the other would wear on the first day of the Main Event. For every day following, the loser would have to pick a superhero's costume out of a hat and wear it. Sebok lost by a landslide and has been wearing the price every since. Gavin just paraded his pal through the tables now, cameras and mics traipsing behind. Director Curtis Hanson and actress Drew Barrymore came to Harrah's press conference to talk about their new poker movie, Lucky You. Barrymore stars with Eric Bana in a story about a father and son who end up playing against each other at the final table of the World Series of Poker. 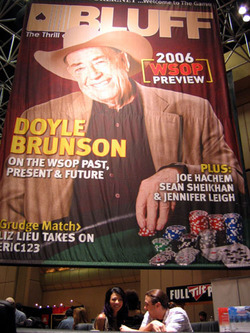 Hanson befriended Doyle Brunson for insight into the poker world, and included him (and Jen Harman) in the actual film that releases September 2006. Continue to the next page for more pics of Doyle Brunson and the movie group. The other day, Brandon Schaefer ran into Greg Raymer after busting out of the $1500 NL event. Knowing that Raymer likes the $5k Stud, Brandon asked him if he was excited. Raymer said he was going to skip it because the $2500 Pot Limit is a televised event and that TV exposure is more important. (Poker Stars found this story, too). Unfortunately, Fossilman didn't last long in the tourney. It's good strategy when you're working to keep your name in lights. However, the TV cameras will be on a different line up tonight. The $5000 Seven Card Stud finalists are up on the stage now. Check out CardPlayer's Live Updates—if you want. 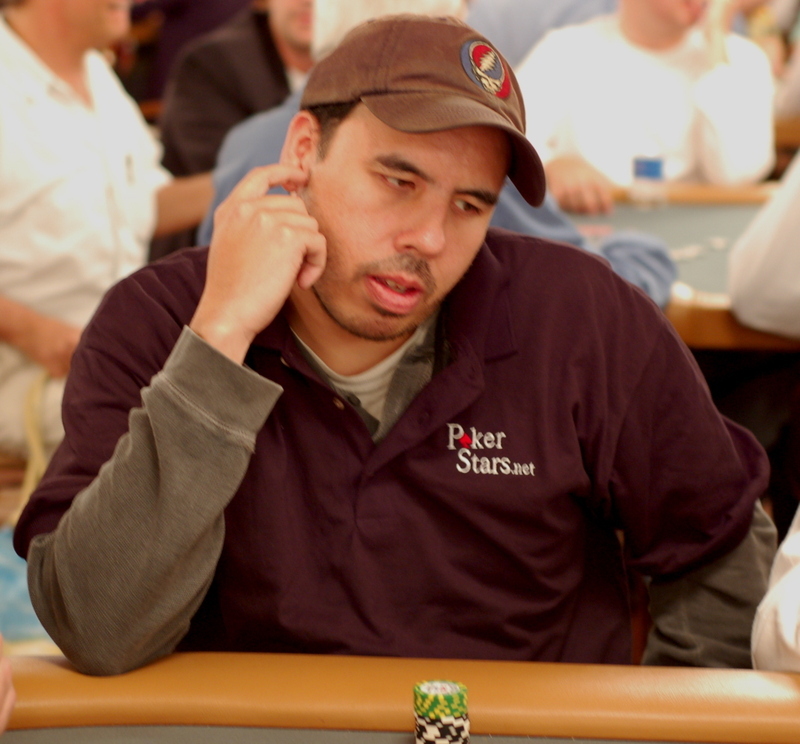 In an email articulating his WSOP Main Event plan Dave Scharf wrote, “Have a standard plan. You can deviate from the plan but if you do you should have some compelling reasons for doing so.” I'm wondering if he shouldn't have sent that advice to Harrah's. While Harrah's "reserves the right to cancel, change, or modify the tournament or any tournament event, in part or in whole, without notice," they seem to have been overachieving on this front during the last few days. Yesterday the start of the $2000 NLHE Shootout got some strong player reaction when players expected to be playing at tables of ten to eleven players and found themselves at tables of six. Granted the published structure didn't rule out short tables, but the wording clearly implied a full table structure. Harry Demetriou went biserk to find he would have to play a short handed table and was escorted out of the venue. Daniel Negreanu showed up a little late to the event to find that his stack had been blinded off 40% faster than he had anticipated. He wasn't a happy camper. But today's snafu was a little nastier. Today's noon tournament was scheduled to be a $1500 PLO with no rebuys. Some time yesterday, Harrah's changed it to a rebuy event. This caused major angst in the poker community; definitely check out Pauly's blog (Pauly pictured above) for his personal trauma. This morning, Harrahs changed it back to a no rebuy event. They then added a completely new bracelet event to start at 4:00pm; a $1500 rebuy PLO event. If you are playing a WSOP event, check early and often relative to changes. 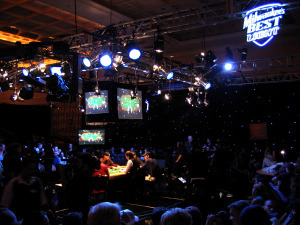 While the employees played in their $500 NL WSOP event, the real talk of the Rio was about the Tournament of Champions. CardPlayer and AOL have a lock on the WSOP coverage, but a look at CP shows that FullTilt is doing the work. A little digging around the net proves that the Pros are not relying on the media to tell their tales from the felt. No, they're relating their play, themselves. 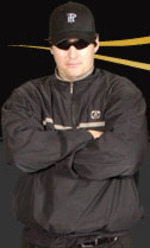 Phil Hellmuth is keeping a journal on his website and calling it a blog. Today, yesterday he talked about showing up to the tourney on time, Mike Matusow's Phil Hellmuth fetish, and Chris Ferguson's betting patterns. Daniel Negreanu, who was battling for the title with Mike Sexton and Mike Matusow is providing his updates via a Video Diary on FullContactPoker.com.